It is important that the base surface is properly treated prior to each repair. Generally, the repair site must be clean, dry, grease-free and partially ground. The hardener supplied is usually sufficient for the filler can content. Often, however, less filler is needed. In this case, use only as much filler and/or resin from the can as is required for the repair because, as soon as the components have been mixed through, the mixed material must be used up swiftly. As a rule, 1 – 4 % can be added; the optimum mixture is 2.5 %. 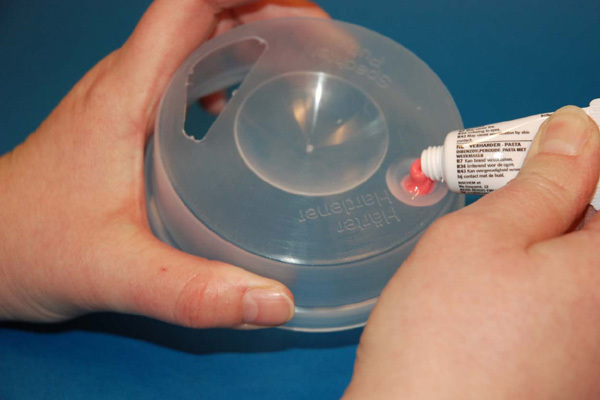 Two lines have been worked into the plastic cap of the product as a dosing aid, which indicate the required amount of hardener for 100 g of resin. All DIY fillers have a dosing cap. 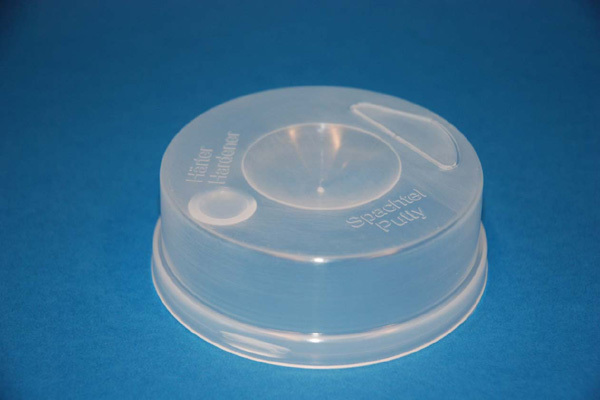 The dosing cap has one indentation for the hardener, one for the filler and contains a spatula. 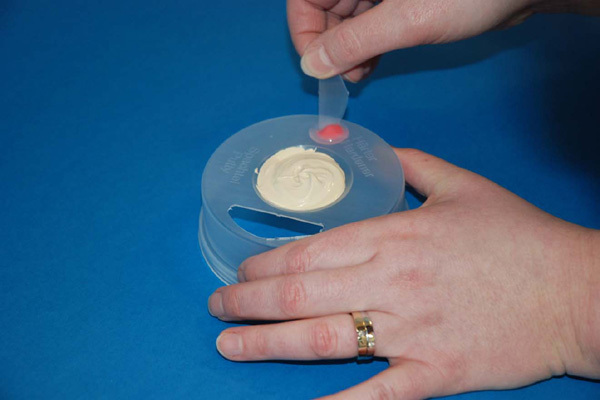 This allows mixing of even the smallest amounts of filler in the optimum mixing ratio. 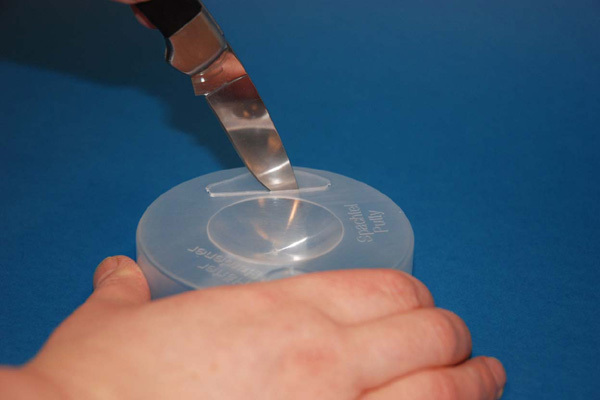 Prior to filling in the two components, use a knife to cut the spatula from the dosing cap. Now dispense the hardener from the tube into the small indentation. When the indentation is level filled, you have got the right amount of hardener. Now insert the filler into the big indentation. Here, too, the indentation needs to be level filled to get the correct amount of filler. Now use the spatula to extract the red hardener from the indentation and add it to the filler. The hardener needs to be properly blended in to ensure that the filler mass hardens completely. When no colour streaks remain in the filler, the mass has been properly mixed through. This is the case after about 20 seconds. Afterwards, the filler loses its colour so that the filler that has been mixed through, and subsequently also its hardened version, will assume its original colour as it was in the can. You can now apply the mixed material to the repair site. Please use a customary spatula blade for this. The optimum ambient temperature is 20°C, with 50% humidity. No filler work should be carried out at temperatures below 10-12°C. After approximately 20 – 30 drying time (see notes on the can label), you may start to grind and/or carry out the next processing step. Filler mass remains which are blended with hardener must never be returned to the can! After filling, please immediately clean any of the tools and, if required, use cellulose thinner to do so.